Countertop installation is a great investment to make. Whether you are installing kitchen countertops, bathroom countertops, or installing countertops in a different area, there are many options to choose from. Among your many countertop choices, marble countertops are consistently a popular option. There are plenty of benefits of marble countertop installation, including its durability, longevity, natural beauty, and its resistant to heat. However, like many other countertop types, in order to derive the benefits of marble countertops for a long period of time, the proper care and cleaning is required. Marble countertops can be a beautiful addition to a home or business and are relatively inexpensive compared to other types of solid-surface countertops, and above all, they are relatively simple to clean and care for. However, even though marble countertops may be easy to clean, the surface is porous and does not mix well with liquids and food, making it essential that they are cleaned properly to avoid wear and dulling the appearance. As the best countertop installation service in Barbados, the team at Fiberpol, Inc. has extensive experience and knowledge about marble countertops and the installation process. So, in order to help those with marble countertops in their home or business, we gathered some of the most effective and efficient ways to properly clean and maintain marble countertops. If you don’t have marble countertops but want to experience the great benefits, be sure to contact the best remodeling service in Barbados, Fiberpol! As we mentioned, there are many ways marble countertops can benefit a kitchen, bathroom, or another area in a home or business. However, for those who may be interested in marble countertop installation, we thought it would be beneficial to do a quick review. Marble is a beautiful natural stone countertop options that can transform a kitchen or bathroom into a luxurious area. The natural stone surface comes in a variety of natural colorations, including hues of gray, black, white, green, pink, yellow, and more. As mentioned, marble countertops are one of the more porous countertop surfaces to choose from, which is why it is prone to staining. It also scratches quite easily, which is expected with its lower abrasion rating. However, with benefits of being heat resistant, durable, and pretty resistant to dents and chips, if cared for properly, marble countertops can really add to the aesthetics of a home or business. Because of marble countertop porousness and vulnerability to acids, knowing how to care for marble countertops is vital to maintaining their durability and beauty for years. Because of the properties of the surface, it is recommended to seal the marble surface. Sealing products will help repel stains, but it doesn’t make the marble surface stain proof. When it comes to sealants to use on marble countertop surfaces, there are two types that are most helpful: penetrating and topical sealant. Penetrating sealant. A penetrating sealant is a surface coating that seeps into the porous properties of the marble surface. This sealant is most recommended for kitchen countertops as it can help limit the number of stains by keeping liquids, such as coffee, wine, and oil, from soaking into the surface of a countertop. Topical sealant. A topical sealant is a surface coating that covers the countertop. Using this sealant can slightly alter the look of the marble surface, but can provide protection effective against acid etching. Due to marble being mostly made of calcium carbonate, the natural stone is extremely sensitive to acidic products. For this reason, it is recommended to avoid cleaning products that do not contain citrus extracts, as cleaners with high acidity levels can damage the marble’s surface. Avoid using cleaners like vinegar, abrasive cleaners, alkaline cleaners not meant for stone, lemon juice, or bleach and ammonia to clean the counter’s surface. Instead, it is best to use a mild, stone soap or neutral pH detergent when cleaning marble countertop surfaces. When cleaning, owners should first rinse the surface with fresh, clean water and dry it thoroughly once finished cleaning. Step One. If you are not using marble cleaner, create your own cleaner by mixing a squirt of gentle, non-abrasive dish soap with warm water in a spray bottle or small bucket. Cover the counter with the cleaning mixture generously, gently scrubbing and wiping off the soapy mixture with a wet and clean washcloth. This process can be repeated until the soapy mixture is eliminated from the countertop surface. Step Two. Using a soft, absorbent towel, rub and buff the countertop until the surface is completely dry. Fiberpol, Inc. Tip: Remember, if liquids on the countertop surface are not cleaned up quickly, they will likely etch the marble, making the surface appear dull. It is important to ensure all spills, liquids, or oils are cleaned immediately to avoid staining. One essential step in cleaning and caring for your marble countertops is being aware of what items can actually damage the countertop surface. By avoiding the following common household items, you can keep a marble countertop in tip-top shape. Hot Items. Hot pots and pans fresh off the stove, or even hot mugs, should never be left on marble countertops for too long without the proper protection. In addition, if marble countertops are installed in a bathroom, the same can be said for curling irons and flat irons. Hot items can discolor and scratch the marble. Wax. 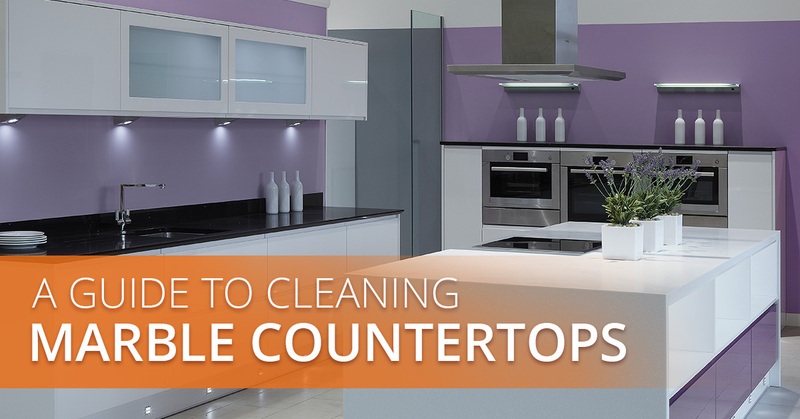 Waxing countertops is a common way homeowners keep their countertops looking pristine. However, wax should be avoided with marble countertops as the wax can cause the surface to discolor. Items that can scratch the surface. Because of marble’s porous properties, it can be susceptible to scratches, which can ruin marbles beautiful appearance. Avoid leaving knives, scissors, and other sharp items on the counter’s surface and always be sure to use a cutting board when cutting items on the countertop. No matter where you have marble countertops installed, like in a bathroom or kitchen, cleaning and maintaining them requires immediate response and extra caution. Plus, performing general cleaning of your marble countertops is not only simple and doesn’t take long, it is essential to making your countertops last. By immediately cleaning up spills and stains and providing general care and maintenance consistently, owners will be able to enjoy the beauty, durability, and longevity of their marble countertops. Marble countertops can be a great addition to any residential or commercial property. When installed, marble countertops can drastically improve the look of a kitchen, bathroom, or another residential or commercial area. If your home or business is in need of marble countertop installation in Barbados, be sure to contact the remodeling service the area knowns and trusts, Fiberpol! Whether you want marble or another one of our appealing countertop styles, you can rely on the professionals at Fiberpol for friendly and affordable countertop installation. To set up a free countertop installation quote, or to learn more about our premium countertop installation services in Barbados, contact Fiberpol today!